Kamau Brathwaite (b. 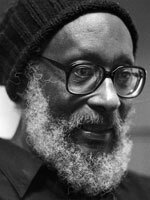 1930), a poet, historian, literary critic, and essayist, was born in Bridgetown, the capital city of Barbados. Brathwaite spent his childhood in Barbados but would spend his adult life traveling, learning, and teaching all over the globe. He attended Harrison University in Barbados and Pembroke College in Cambridge, England, where he graduated with honors in 1953. After graduating from Cambridge, Brathwaite embarked on a journey to Ghana where he worked in Ghana's Ministy of Education for more than ten years. Brathwaite familiarized himself with Ghanaian traditional verse and pre-colonial African myths, which would be influencial to his own writing. Later on, he earned his PhD in Philosophy from the University of Sussex in 1968. He has taught at Harvard University, the University of the West Indies, and New York University. In his 1994 Neustadt speech honoring Brathwaite, Kenyan author Ngũgĩ wa Thiong'o stated, "What is so remarkable about him is not that he is a great poet, historian, critic, and teacher, but that these are not separate entities in himself. They are rather expressions of a searching spirit, searching for the connective link in human life and struggles." His works include the Rights of Passage trilogy (Oxford University Press, 1967-1969), Days & Nights (Caldwell Press, 1975), Mother Poem (Oxford University Press, 1977), History of the Voice: The Development of Nation Language in Anglophone Caribbean Poetry (New Beacon Books, 1984), Sun Poem (Oxford University Press, 1982), Middle Passages (New Directions Books, 1992), Dream Stories (Longman, 1994), Born to Slow Horses (Wesleyan University Press, 2005), and, most recently, Elegguas (Wesleyan University Press, 2010).